SAVE THE DATE! Our annual all-church retreat is scheduled for April 5-7, 2019. The retreat is a short drive to the Piney Woods at Camp Allen. Join us for a wonderful weekend of fellowship and renewal in a beautiful setting. Campsite 1 is our location for 2018. Click here for a larger version. What do I get for $55/person? Friday: Check in anytime after 4pm for a night in the Piney Woods - relaxing, games, fun. Friday is bring your own dinner. Saturday: meaningful morning session with large and small group discussions, creative and fun breakout sessions in the afternoon, canoeing on the lake, walks in the woods, wine and cheese social before dinner. Saturday: 8:30am-6:30pm childcare for PreK and Elementary age kids. Sunday: Beautiful outdoor worship service on the lake! Three meals on Saturday and Sunday breakfast - we all work on that as a team. 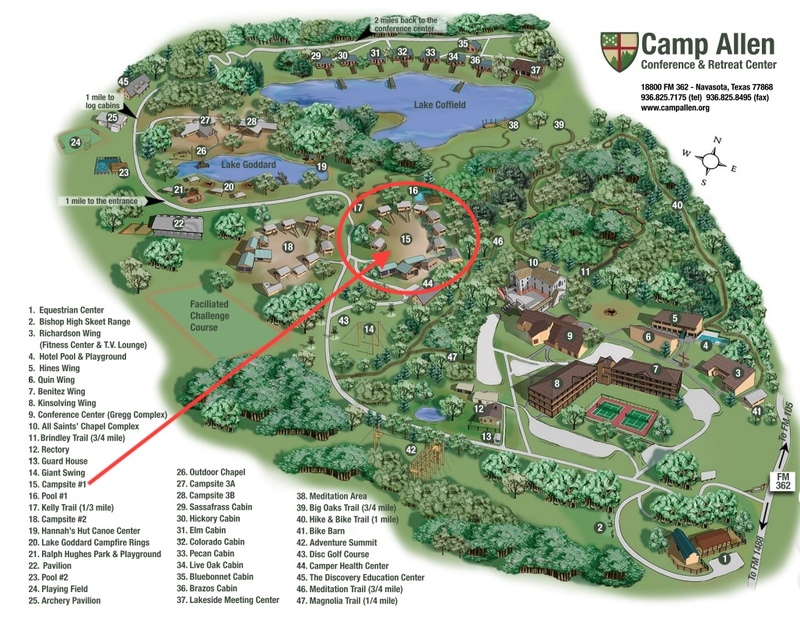 You can pitch a tent on the camp grounds or pick a tree house room. Each treehouse sleeps 10. Ground level cabins are available for those who cannot climb the stairs. Private motel-style rooms (4) are reserved for those with children under 5. Did we mention you can nap?!? Check out by 11am on Sunday. *If you are unable to pay this amount, please pay what you can. We want EVERYONE who wants to, to be a part this retreat. If you are able to pay more than the cost/person to help cover the cost, that is appreciated.